SORRY, NO LONGER AVAILABLE - WE SUGGEST OUR OTHER SIGNS and WALL DECOR. 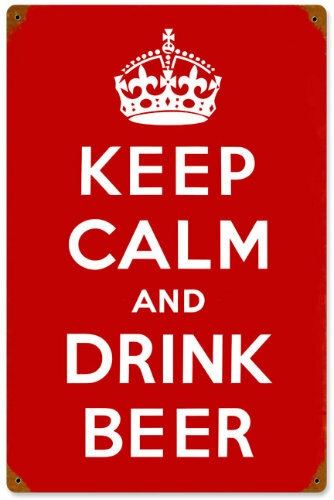 This Keep Calm and Drink Beer Vintage Metal Sign has a long lasting finish, is approximately 12 in. x 18 in. and is drilled and riveted for easy hanging. This quality sign is finished with a vintaging process done by hand to give this sign an aged look and feel. Proudly hand made in the USA, is just under 2 lbs. and made of heavy 24-gauge American steel. Therefore, this is NOT a tin sign. PROCESSING/SHIPPING: Approximately 1 business day for processing (2 days during the holiday season) and 2-6 business days for shipping. NEED IMMEDIATELY? See IN A RUSH? See Holiday and Father's Day Shipping Schedule in May, June, November & December.